2017 remains remarkable for Arctic shipping development. LNG shipment continues with a brand-new fleet of huge and capable ships with Double Acting technology which we developed decades ago. The firs in the series of 15, Christopher de Margerie sailed the entire Northern Sea Route and delivered LNG cargo from Norway to Korea. Both the Northern Sea and Northern West routes have been known for centuries, but could it finally be the time for a significant increase and utilization of these routes? 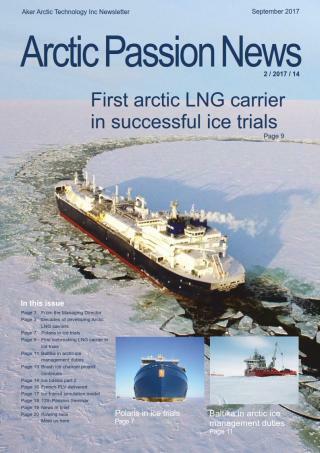 In this issue of Arctic Passion News, you can read about developments in various ice classed vessels, including Arctic and Antarctic. Page 2 Are we on the verge of the arctic opening up to regular shipping?